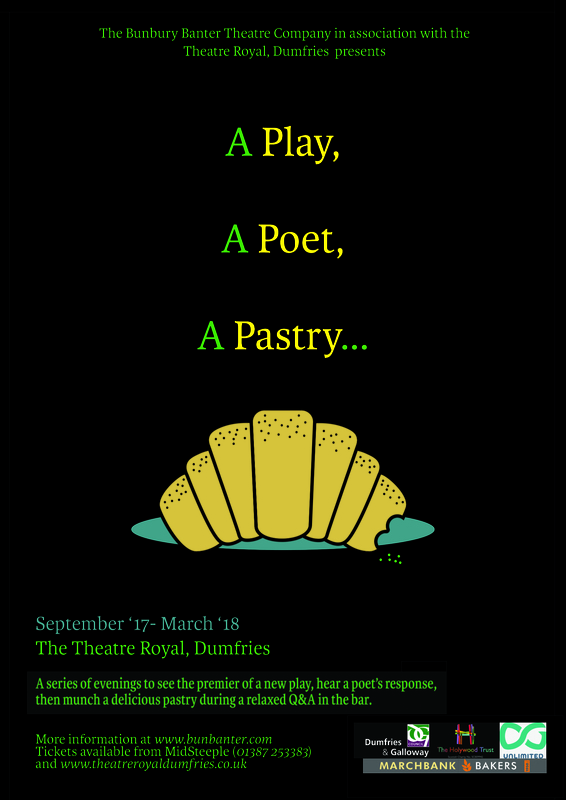 The Bunbury Banter Theatre Company in collaboration with The Theatre Royal Dumfries, is producing a series of bi-monthly events, happening between September 2017 and March 2018, under the title ‘A Play, A Poet & A Pastry’. ‘A Play, A Poet & A Pastry’ involves the high-quality semi-staging of a new studio piece, presented alongside poetry written in response to the play, which is also be performed during the event. Following this, there will be pastry eating for all and a Q&A in the bar with the actors, creatives and poet, to conclude the evening. These evenings, taking place in Scotland’s oldest working theatre, promise to weave first-rate and engaging entertainment, alongside an informal, lively and social atmosphere; perfect for mingling and mulling over the theatrical offerings, for both audience and creatives alike. Whilst not fully presented, the plays will have the same production values as a fully-fledged show and are intended to offer playwrights a fresh opportunity to develop and present new work in a safe environment, with the support of experienced and professional theatre makers. This is the second call out for scripts for consideration for use in A Play, A Poet & A Pastry. It is 40-45 minutes in length, with a small cast; maximum of three. It has not been produced elsewhere. It is a play for the stage (not TV, film or radio). The space to develop a new piece of work, then shown in front of a live audience. The opportunity to work within a group of dedicated, experienced and collaborative creatives. Constructive and sensitively delivered feedback. An equitable agreement between the Producer and the writer. Email info@bunbanter.com with ‘A Play, A Poet and A Pastry’, as the subject header. A brief biography of yourself and your work (up to 200 words). A short and snappy summary of the play (100 words). 11pt font of your choice, but simple is best. No Wingdings. You may wish to use writing software such as Final Draft or Celtx (which is free) to help with the layout.